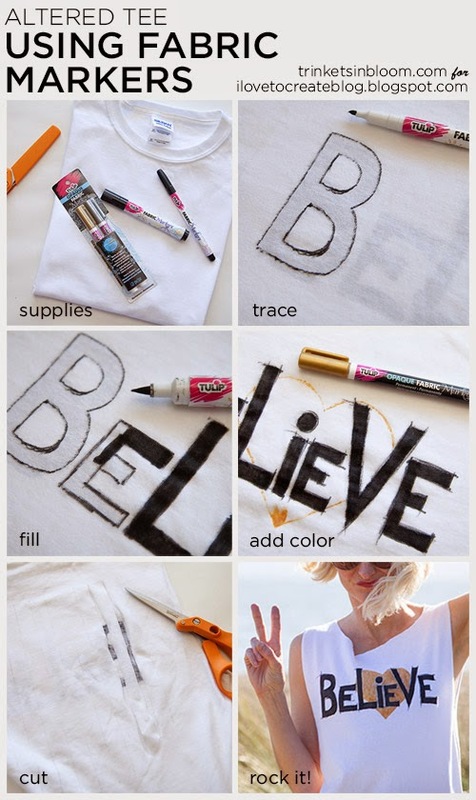 One of the fastest and most fun ways to create designs or patterns on a t-shirt is with fabric markers. They’re definitely one of my favorite crafting supplies; they're easy to use, add great color and stay on through the wash! What’s not to love! 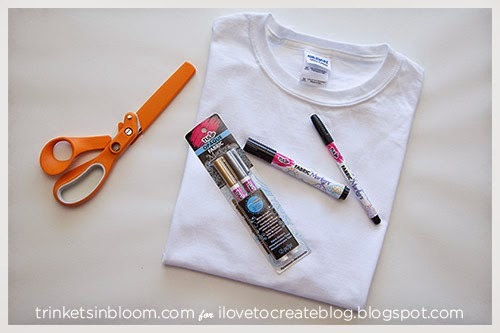 Alter a t-shirt with this simple tutorial to personalize your t-shirt with fabric markers and while you’re at it we’ll cut it up for a chic new look! I drew my design out on a piece of paper and traced them with marker so that I could see them through the t-shirt. 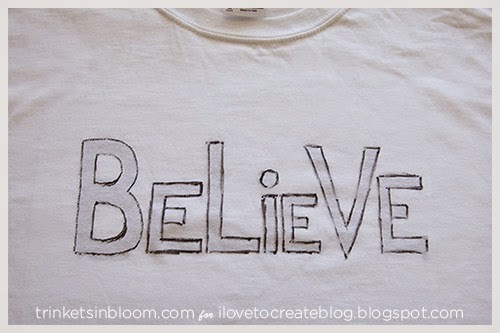 Place your design inside your t-shirt where you want your design to be. 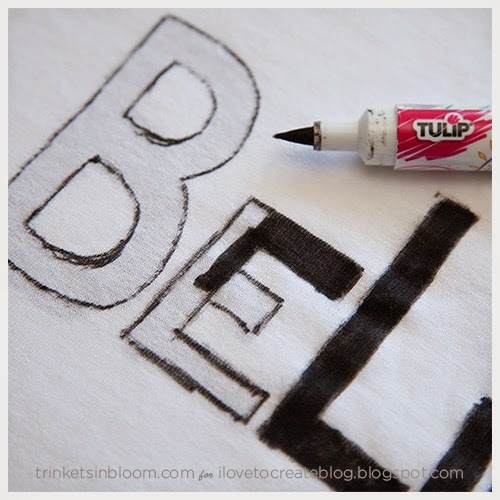 Using your fabric markers trace your design on the front of your t-shirt. 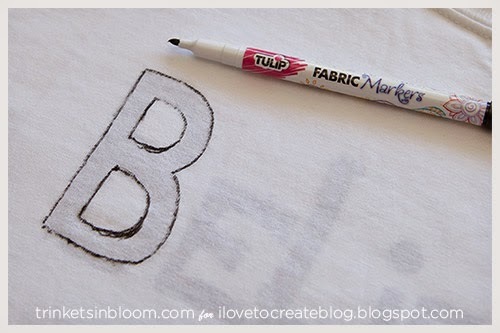 Using one of the thick fabric markers fill in your letters. 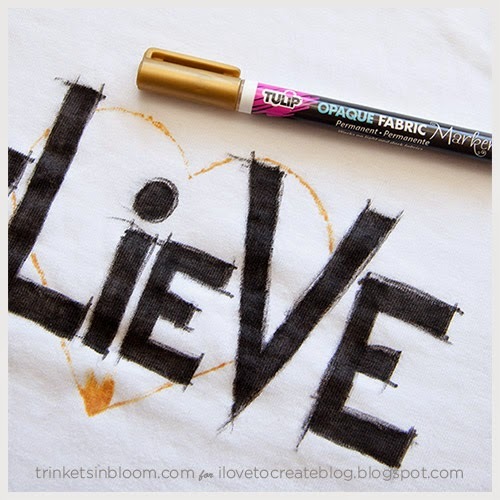 I used the opaque fabric markers in gold to fill in my heart. Once I was done with my letters I went back in and created some sketch lines on and around my letters. Cut the sleeves off the t-shirt. 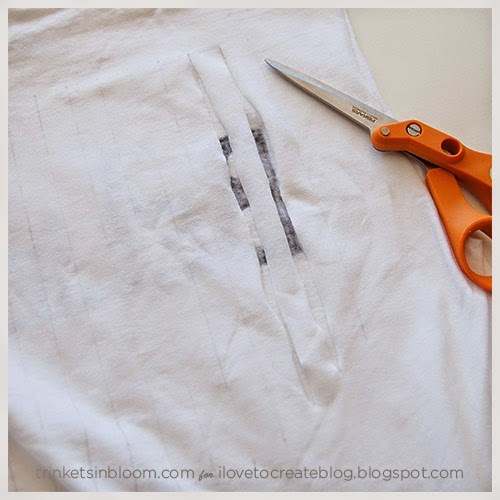 Starting down about 3 inches from the bottom of the back neckline, draw vertical lines down the back about ¾ of an inch apart. I created a bit of a rounded bottom by making the inside lines a little longer. Pull your t-shirt from the top and bottom to open the strips a bit. I went back in an cut off the neckband and brought the sleeves in a bit too. 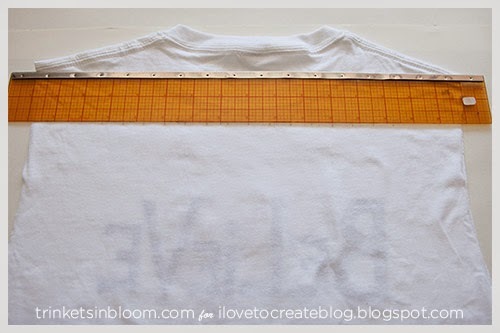 You can alter your tee to best fit you. No time to make it now, PIN IT for later! 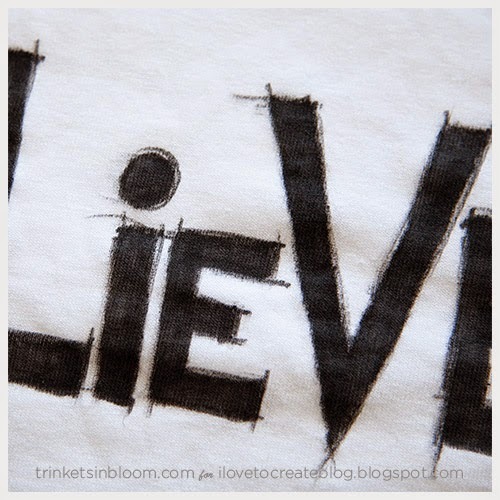 To see more fashion DIYS be sure to check out my blog Trinkets in Bloom! 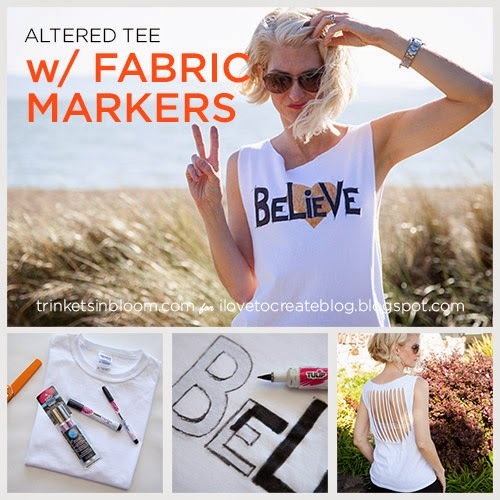 Alter a t-shirt with this simple tutorial to personalize your t-shirt with fabric markers and while you’re at it we’ll cut it up for a chic new look! Isn’t it so exciting and interesting to see that you can do something or crafts on your own. 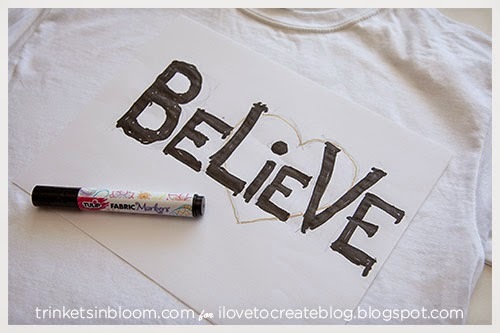 Those DIY tips and tutorials are so helpful for you to become creative and artistic in your own way. That's some great DIY work. Thanks for showing the step-by-step process. 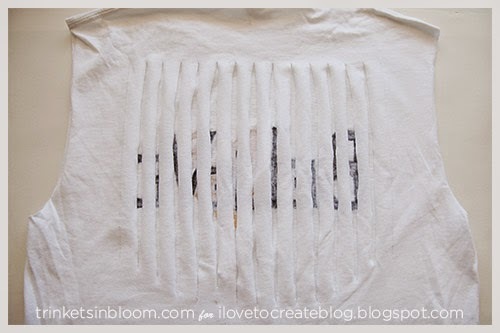 It’s great that not only do you instruct people how to make a shirt like this themselves, it shows them the many ways that cloth can be reconfigured to create different effects. I'm really looking forward to seeing what else others will do to shirts given the knowledge you have just imparted here. Cheers! Merryjanestees LLC is an online retailer of Direct to Garment printed graphic t-shirts. We design all our t-shirts in house and offer some of the most creative and unique designs on the web. Our graphic designers are always looking for fresh topics and ideas to express on tees. We’re passionate about making our customers happy with super high quality prints on top of the line t-shirt brands. The brands of our t-shirts include American Apparel, Next Level, Gildan, Anvil and many more. Merryjanestees Offers all kind of Tee Shirts, Women's Tops, Ladies Tee Shirt, Funny T-Shirts, Mens Graphic T-Shirts, Joke T-Shirts, Cool T-Shirts and Personalized t shirts. This kind of T-shirts are fabulous to wear. They are not only fashionable but also educational. 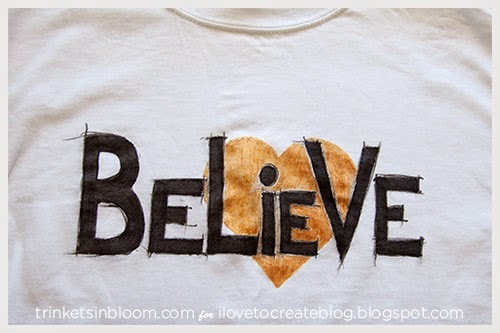 Unbelievable post great idea to design cool and fashionable t-shirt. I love wearing t shirts because of the comfort it gives. Very cool post, your t shirt looks super 90's. I use to love doing this in my teens, I should get back into it really. 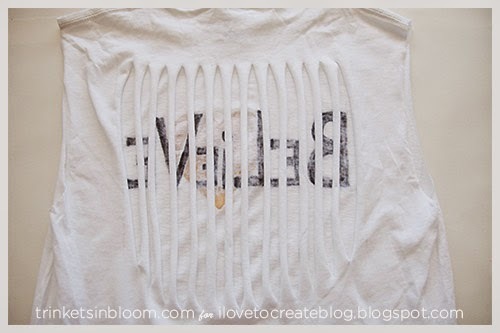 I have so many old t shirts that could do with re-working. 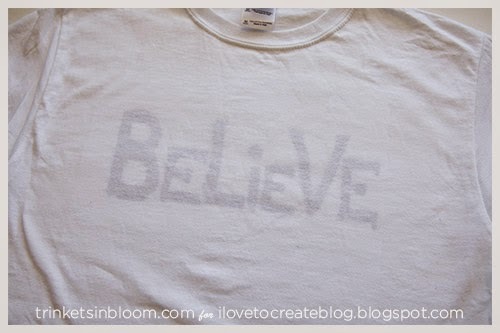 There are some great places where you can get t shirt templates too! very beautiful T-shirt.People will like this style. Lounge area outline is essential on the off chance that you have visitors, and your decision of lounge area stylistic theme and furniture is similarly imperative. Here are some tips on making the best of your lounge area, regardless of what size it might be. A look a lounge area furniture and how current furniture can totally change your eating territory. Every one of the things you'll have to consider to change your feasting territory are incorporated so you won't overlook anything. I have to say this has been probably the most helpful posts for shirts Please keep it up. I cant wait to read what's next. The web is an overall wonder; locales from everywhere throughout the world are accessible to us whenever of the day, which is the reason increasingly individuals are making their own particular sites. The origins of the contemporary golf shirt and polo shirt goes back to the late 1920's. Designed by a world-ranked tennis player, his tennis shirt soon became the shirt-style of choice among athletes whose sport was played outdoors. Most men who have bought a custom dress shirt prefer to wear them as they fit properly and the styling is tailored to their specific tastes and preferences. A prefect shirt can have the 'ideal' fabric in terms of pattern, color, texture and weight whilst also having the particular styling for the cuff and collar to match the fabric and occasion. Fashion wearing regards with men’s and women’s leather jackets and coats available for sale online with best available prices which shipped comprehensively after sale internationally within USA including European region also all gulf cooperation countries like UAE Saudi Arab we care consumer’s need so well. Here is my website….Hope you like it……..
Great Blog,Thanks for sharing this blog. Good design, its inspired me. If you want to make custom merchandising please visit our website CustomBagus . If someone want to read more about that blank t shirt wholesale I think this is the right place for you! Creative and attractive design.Useful blog. keep up the work. Don't miss to checkout Shirt alterationsin London. 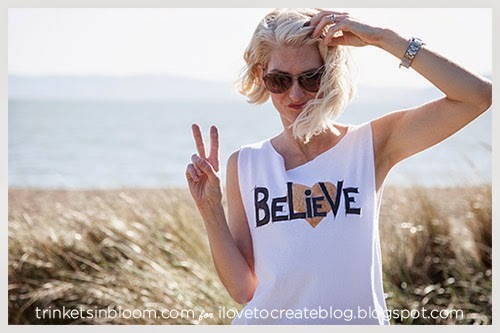 Wow, Amazing blog-post about transformation of Long t shirts women's. Keep sharing such innovative ideas. Blank American Apparel keeps things California cool with the F397 cropped zip up hoodie. Summer can last all year long with this funky cropped style! Cool Article. Hoping you will continue posting an article.